Very interesting. What SSAS memory limits did you use when affinitized to one NUMA node? I do have another (28Gb) tabular cube on there, so memory is a little tight at the moment when limiting to a single NUMA node – hoping for a bigger server with faster memory soon! Yeah that’s what we’re seeing. The problem is in this environment we only have a single large database, so we can’t split it – and the hardware was not originally specified for use with the Tabular model so it’s far from ideal. Just goes to show that you need to know what you’ll be using it for before buying a server! at some point the CPU power is no longer the bottleneck ? How much data are you scanning in memory ? Both queries were scanning approx 900m records, with 200m distinct customers. The two queries show different CPU profiles. One CPU limited, one not. 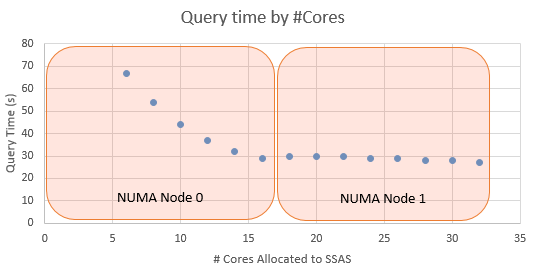 The simple ‘single result’ query, which just asked for the total distinct count across the entire table, kept improving as cores were added (within a single NUMA node). The more complex query split the results up into about 600 cells, split using a number of different attributes from different tables. This performance levelled out at 8-10 cores. My assumption at the moment is that this performance is being constrained by the memory speed (only a frustrating 667Mhz on this server). I’m hopefully getting hold of a 1866Mhz RAM server to test this theory. Henk – correction, my comments apply to the later tests (https://www.purplefrogsystems.com/blog/2014/02/ssas-tabular-performance-numa-update/), not these. This was a smaller dataset, and the CPU performance tests were flawed, as explained on the update post. We have performance degradation in Physical Servers(512Gb) but not in Virtual Machines. (128gb) to process Tabular Models whose max size is 37Gb database size. While your test are conducted to measure Query Performance, can we say the same is true for Processing performance on physical servers(separate SSAS instance) are degraded because they are not NUMA aware? That’s an interesting question. Certainly VMs can help overcome NUMA limitations due to being able to set the NUMA node affiliation for a VM. However they commonly create their own other performance issues, so it’s a balance. Regarding processing, I can’t say for sure as I haven’t conducted tests, but my expectation would be that yes, processing is also likely to be impacted by NUMA. Simply because all memory operations are impacted when crossing NUMA nodes, this is independent of the specific workload. NUMA aware systems overcome this by aligning the data held in memory and the CPU accessing that data so that they’re on the same node. This would be specifically problematic for SSAS Tabular 2014 and earlier, as it is only able to process a single partition for each table at once. In Tabular 2016 onwards, partitions can be processed in parallel, so the parallelisation offered by a multi-NUMA environment may outweigh the possible performance degradation of each core. Thanks Alex for your feedback. We will try to push towards testing NUMA Affiliation in our labs to weigh its outcome. Will keep you posted here. This has been tested on VM/labs. Processing times improved by 60%. Kay, can you provide some more details about the tests you made? I would really appreciate. Thanks!